This concrete floor sweeper excels in wide open areas, like those found in a typical warehouse. The front edging brush pushes debris and dust into the center of the path, while the large bristle cylindrical broom sweeps everything into the large 9 gallon hopper. The vacuum also helps to control the spread of dust and fine materials. This is the perfect machine to use before scrubbing your floors with an walk behind automatic floor scrubber. The CleanFreak EasySweep comes with a 12 volt maintenance free battery and an on-board battery charger so you never have to worry about dragging around a power cord. And with a 2 to 2.5 hour run time, depending on the surface you're sweeping, you can easily sweep a 60,000 square foot facility on a full charge. The machine weighs 120 pounds, which makes it easy to transport from job to job. The 24" sweeping path covers a large area, for the minimum amount of passes on each job. The automatic shake out filter makes sure that the maximum amount of dust is captured. This helps in controlling the amount of dust in the air, and recovering the maximum amount of debris on concrete, sport court, rubber, vinyl, tile, and carpeted floors. The "EasySweep" has never been offered at such an affordable price. At the current cost, the concrete warehouse sweeper will pay for itself in as little as 3 months with the amount of labor hours it will save you. If you save an average of 30 minutes per day on cleaning, that's an average saving of 14 hours labor per month. Many employers find they can cut as much as 2 hours labor per day with this wide area sweeper vacuum! If you are looking for a larger machine, or something smaller for indoor, or outdoor use, take a look at our complete line of walk behind concrete floor sweepers. Cordless sweeper can be run on either a hard surface or a carpeted floor. Battery powered for a maximum of 2.5 hours of run time, with a 5 hour charge time. Works great on indoor or outdoor dry surfaces, especially warehouses. 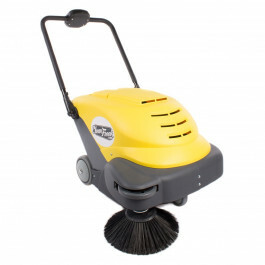 Can sweep up to 30,000 square feet per hour at its maximum performance level. 24" sweeping path cuts down on repeat passes, by maximizing recovery area. Side edging brush pushes debris from corners and edges to center of the machine. Center cylindrical brush sweeps everything into a large recovery hopper. Vacuum motor helps recover debris, and keeps dust out of the air, especially on concrete floors. Customers who were interested in the CleanFreak® 'EasySweep' Warehouse Sweeper were also interested in the following items. I use this product in a manufacturing environment and it works great. Picks up dust and debris with ease! Good product and value for keeping warehouse floors clean. Works well on our concrete warehouse floors. Even some older uneven areas. Picks up everything from staples and small rivets to larger wood pieces in much less time than sweeping. Could use a little more suction for dust. Only problem is when the automatic height adjustment makes a sound requiring you per instruction to tip up the front of the vacuum cleaner to get it to quiet down. When we do that it tends to release a cloud of dust and often takes a few attempts to get it to adjust properly. Buying a 2nd sweeper for our other facility. We really love this sweeper. Easy to use and can see a big difference on the amount of dust on the concrete shop floor. EasySweep is just that the easy sweeper to use!! Pros: Easy to Use, Efficient, Powerful, Simple Setup, Simple Instructions, Great Mobility, Good Quality, Price, This is VERY easy to set up and use. We use this to sweep our warehouse before cleaning the floor. It's great!!! However, the most amazing feature is its quietness. When we are using it, kids and adults flock around it and want to push it around themselves. Yes, it can be used any time without annoying anyone using our gym! A wonderfully designed tool perfect for us! We received the vacuum within a week of ordering and let it charge as the manual said (you did read the manual right?) The first janitor used it for almost three hours on the most powerful setting. We have since moved it to other buildings and it has worked well in each testing. While it doesn't replace your uprights or canisters completely, it does a great job covering those large areas quickly and efficiently. This is a review for the CleanFreak® 'EasySweep' Warehouse Sweeper.